16 Hereford is located on the east side of Hereford, between Beacon and Marlborough, with 14 Hereford to the north and 18 Hereford to the south. 16 Hereford was built ca. 1871 for builder and contractor George Martin Gibson, one of four contiguous houses (14-16-18-20 Hereford) built for speculative sale. The land for 14-20 Hereford was purchased in two transactions by George Gibson’s wife, Frances Rebecca (Esten) Gibson: on April 14, 1871, she purchased the lot at the corner of Marlborough and Hereford with a 50 foot frontage on Marlborough, and on September 10, 1871, after the houses were substantially complete, she purchased a five foot wide lot to the east. She purchased both lots from George Williams Pratt, an investment banker and stockbroker and one of the founders of the Boston Stock Exchange. He and his wife, Mary Barrow (White) Pratt, lived at 13 Louisburg Square. They also maintained a home, Oakley, on Belmont Avenue in Watertown (it became the Oakley Country Club in 1898). The land originally was part of a larger parcel purchased from the Boston Water Power Company on February 20, 1863, by George Pratt’s son, Robert Marion Pratt, also a banker and broker. Click here for an index to the deeds for 16 Hereford. Also on September 10, 1871, George Pratt sold George Gibson the land to the east, with a 250 foot frontage, where George Gibson subsequently built eleven houses at 337-357 Marlborough. When the Gibsons sold the completed houses at 14-20 Hereford, they included in the deeds a three foot six inch easement across the rear of 14-16-18 Hereford to provide for a passageway and drainage to the alley for 14-16-18-20 Hereford. On October 7, 1871, 16 Hereford was purchased from Frances Gibson by Emma B. (Streeter) Davis, the wife of Frederick S. Davis. They previously had lived at the Coolidge House hotel. Frederick Davis was cashier (and later president) of Traders’ National Bank. They continued to live at 16 Hereford during the 1882-1883 winter season, but moved thereafter to 200 Dartmouth and then, by 1885, to 377 Beacon. On May 25, 1883, 16 Hereford was purchased from Emma Davis by sisters, Miss Eunice Whitney and Miss Mary Whitney. In 1880, they had lived with their brother, banker George Whitney, at 75 Marlborough. Eunice Whitney died in June of 1888, and Mary Whitney moved soon thereafter. She continued to own 16 Hereford and lease it to others. During the 1888-1889 winter season, 16 Hereford was the home of John William Mackintosh and his wife, Minnie Helen (Diggles) Mackintosh. They previously had lived at the Hotel Vendôme. He was a banker and broker. By the next season, they had moved to Brookline. During the 1889-1890 winter season, 16 Hereford was the home of Selina M. (Gibson) Bixby, widow of Henry C. Bixby. He had been paymaster of the Atchison, Topeka, and Santa Fe Railroad and had died in February of 1887 in San Diego. By the next season, she was living at 591 Beacon. During the 1890-1891 winter season, 16 Hereford was the home of dry goods commission merchant George Richards Minot, Jr., and his wife, Agnes (Olney) Minot. They had married in October of 1890 and 16 Hereford probably was their first home together. 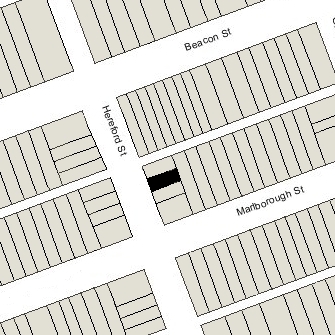 Prior to their marriage, he had lived at 245 Marlborough. By 1892, they had moved to Milton. During the 1891-1892 winter season, 16 Hereford was the home of Mr. and Mrs. W. A. Allen. On October 16, 1893, 16 Hereford was acquired from Mary Whitney by Gertrude (Huidekoper) Wells, the wife of Dr. Frank Wells. He was a physician and medical director for John Hancock Life Insurance. They previously had lived in the Longwood district of Brookline. The Wells’s three surviving children – George Doane Wells, Edgar Huidekoper Wells, and Elizabeth Wells – lived with them. In June of 1913, Gertrude Wells, Edgar Wells, and Elizabeth Wells traveled to England. 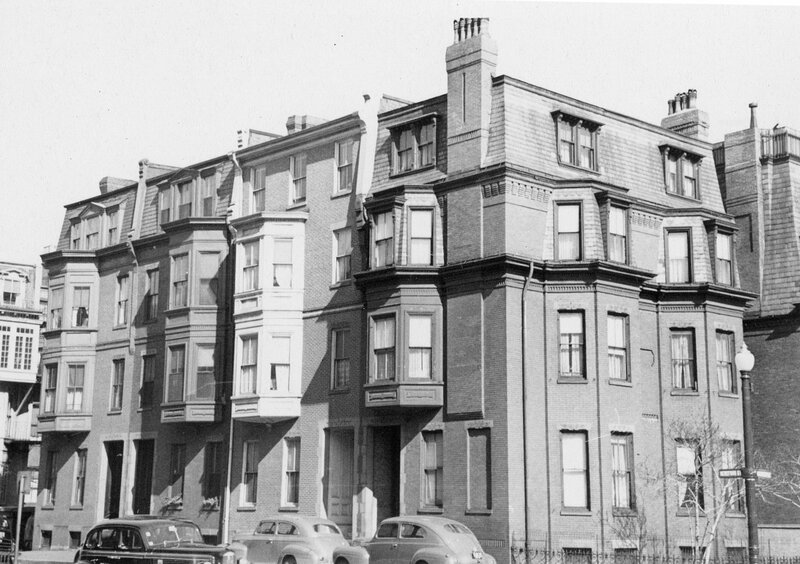 Frank Wells and George Wells remained in Boston. Gertrude and Elizabeth Wells lived primarily in Torquay. Edgar Wells worked at the American Women’s War Hospital in Paignton in Devonshire and then with the Rockefeller Foundation. Elizabeth Wells married in June of 1915, in Torquay, to Jordan Herbert Stabler, second secretary at the American embassy in London. A career diplomat, he also was an author and, after leaving the diplomatic service, was European representative for Gulf Oil. Gertrude Wells and Edgar Wells returned to Boston in July of 1915. Edgar Wells subsequently went to Washington DC as director of chapters of the American Red Cross, then returned to London with the Red Cross. He enlisted in the US Army and served as a military attaché in the US Embassy in London. Frank Wells died in March of 1919. Gertrude Wells continued to live at 16 Hereford, and George Wells continued to live with her. They also maintained a home in York, Maine. Edgar Wells joined them by the 1920-1921 winter season, but moved to New York City in about 1923 and became a dealer in rare books and prints. Gertrude Wells died in April of 1928. 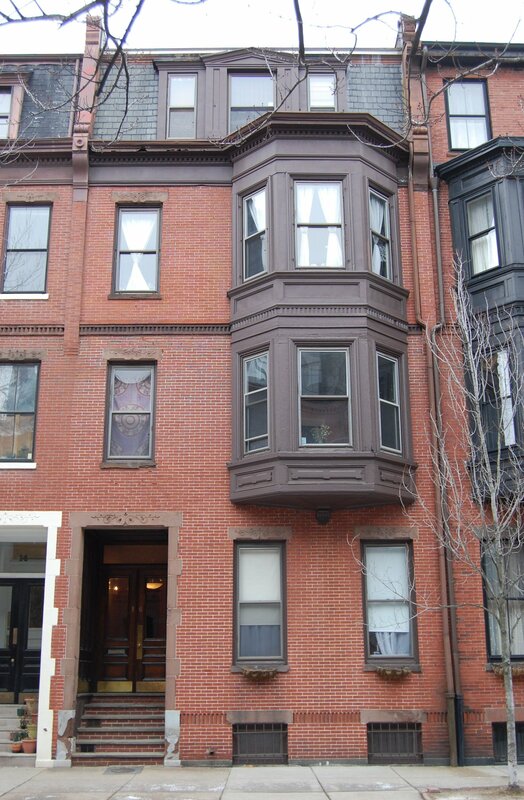 After his mother’s death, George Wells moved to 925 Boylston. 16 Hereford was not listed in the 1929-1931 Blue Books, and was shown as vacant in the 1930-1931 City Directories. On August 22, 1930, real estate dealer Edward J. Ball, presumably acting on behalf of the Wells family in conjunction with the property’s sale, applied for (and subsequently received) permission to convert the property from a single-family dwelling into four apartments. On August 26, 1930, 16 Hereford was acquired from George Wells, Edwin Wells, and Elizabeth (Wells) Stabler by George Peirce and his wife, Marian W. (Greene) Peirce. The deed was not recorded until March 20, 1931. On December 7, 1932, they transferred the property into Marian Peirce’s name. The Peirces lived in one of the apartments at 16 Hereford in 1932. They previously had lived in Medfield, and by 1933 had moved to Bristol Ferry, Rhode Island, where they operated a tavern..
On July 19, 1939, the Suffolk Savings Bank for Seamen and Others foreclosed on its mortgage and took possession of the property. On July 19, 1939, 16 Hereford was acquired from the Suffolk Savings Bank by real estate dealer Henry Joseph O’Meara, and on the same day he conveyed it to Norma Calvin Vietrie and her sister, Juanita Montgomery Vietrie. Both were art teachers, Norma Vietrie formerly in Lewiston, Maine, and Juanita Vietrie formerly in Keene, New Hampshire. They both married in 1942, Norma Vietrie to Frank Foster Hines, a mechanical engineer, and and Juanita Vietrie to John O. Silvey, an electrical engineer. Both couples lived at 16 Hereford until about 1952. On November 13, 1953, 16 Hereford was purchased from Norma Hines and Juanita Silvey by Irving J. Rosenfield, He was a widower – his wife, Rebecca (Kaplan) Rosenfield, having died in May of 1950 – and lived in Beverly. On March 8, 1954, he transferred the property to himself as trustee for the benefit of his children, Gerald Alvin Rosenfield and Shaila A. Rosenfield. On November 26, 1954, 16 Hereford was acquired from Irving Rosenfield by Arthur J. Bryant of Lynn. In June of 1964, he filed for permission to legalize the occupancy as five (rather than four) apartments, indicating that was the number of units in the building when he purchased it. He subsequently abandoned the application. The property changed hands and on April 1, 1965, was acquired by Pierre L. de Bourgknecht. In February of 1966, he filed for (and subsequently received) permission to legalize the property as a five-unit apartment house. On July 1, 1985, 16 Hereford was purchased from Pierre L. de Bourgknecht by Solomon Boucai and Barry P. Winer, trustees of the Sixteen Hereford Street Realty Trust. 16 Hereford remained an apartment building, assessed as a four- to six-family dwelling, in 2017.